Conjuring up a magic hat full of coins is the goal in Legacy of the Wild, a sorcery-themed video slot from Playtech. Available on desktop, tablet and mobile devices, this 5 reel, 40 payline game comes with collapsing reel re-spins, expanding wilds and a bonus feature that offers up to 50 free spins. Join the quest from 40p to £2,000 per spin. Playtech are 1 of the world’s biggest, and best, video slots developers and they haven’t reached those lofty heights by creating ugly looking games. Legacy of the Wild is another impressively designed offering – set against the backdrop of a sorcerer’s workshop, the reels include 5 lower value amulet symbols. They’re joined by an apprentice magician, a mysterious woman in red, an orc-style creature and possessed looking sorcerer. The most lucrative symbol is the bearded, Gandalf-like figure who offers payouts of up to 750 coins. The game is played using a Collapsing Reels feature – after a winning spin, the successful symbols are removed with new symbols dropping in to replace them. These waves continue as long as there’s a new winning combination on show somewhere on the reels. Keep a special eye out for the magical Book of Wild logo which is the wild – it replaces all other symbols and offers payouts of up to 750 coins. On each successive wave win, the wild expands in the Book of Wilds feature. Land 1 on the second wave and it will turn the space immediately to its left wild too. Wilds on wave 3 spread to the left and 1 place above. On wave 4, the wild will spread 1 space up, down and to the left. Any wilds on wave 5 or more will spread 1 space up, down, left and right to create a cross formation and plenty of winning opportunities. Any wilds that land during the feature expand to the full 5 symbol cross formation. Wave wins are in play here too. You can keep tabs on the number of successive wins you’ve enjoyed via the Wave-O-Meter to the left of the reels. Legacy of the Wild is a well-produced title – the visuals are sharp, the soundtrack suitably fantastical and the game engine super smooth. There’s plenty of action on offer in the base game thanks to the collapsing reel wins. The best winning opportunities come via the Free Games feature though where the fully expanded wilds can have a big impact, especially if you land more than 1 of them on the same free spin. They’re not the easiest to trigger but we found the free spins to be well worth the wait. 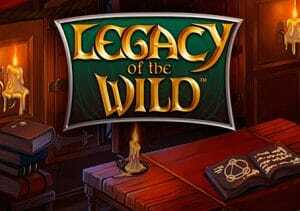 This is another enjoyable and very playable game from Playtech – it may not boast the widest range of extras but there’s much to enjoy in Legacy of the Wild. Get lucky with those spreading wilds and this sorcerer can cook up plenty of action. If you like consecutive wins, there are plenty of choices with Playtech’s Wild Wishes also offering a similar theme.